A worker holds up a piece of mercury-gold amalgam at the Bagega processing site. The gold extraction process produces dangerous lead as a byproduct. In March 2010, Doctors Without Borders/Médecins Sans Frontières (MSF) was alerted to a high number of child fatalities in Zamfara state, northern Nigeria—an estimated 400 children died. Laboratory testing later confirmed high levels of lead in the blood of the surviving children. The root cause of the lead poisoning crisis is unsafe mining and ore processing. People who engage in mining and ore processing must be given access to facilities and programs to allow them to safely mine and process ore without exposing themselves or others to toxic lead. Chelation therapy will only work with remediation (otherwise the child continues to live in a contaminated environment and ingest lead), and in the long term effective remediation requires safer mining practices to be introduced. While seven of the worst affected villages have been remediated, significant remediation is still needed in new sites, particularly in the town of Bagega where an estimated 1,500 children are exposed to lead poisoning. Some people in Bagega have started to try to remediate their own compounds. MSF cannot provide effective treatment in locations, such as Bagega, that have not been remediated. MSF treats the sickest children at its inpatient facility in Anka hospital. - More than 2,500 children have been enrolled in the programme. - About 2000 children are still on treatment. - About 500 children with blood levels below 45 μg/dl are on follow-up but not active treatment. - Around 300 children have been discharged so far. MSF operates outreach clinics in 7 remediated villages. MSF cannot provide medical care without remediation (chelation therapy is not effective unless the patient stops ingesting lead). 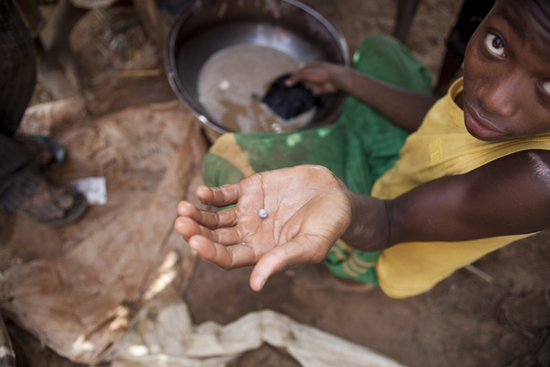 MSF clinics identify possible cases of lead poisoning and treat less severe cases. Critically ill children are transferred to MSF inpatient facility in Anka town. It is clear that some children are continuing to be exposed to lead in villages that have previously been remediated. Since May 2011, some patients’ blood lead levels have trended upwards, consistent with re-exposure to lead, in villages where there is evidence of ongoing unsafe ore processing. Adults and children over 5 are susceptible to lead toxicity, but children under 5 are especially vulnerable, as they are most at risk for serious morbidity and death. - Children are closer to the ground than adults, and often crawl, getting dust on their hands, which then ends up being ingested as they eat with those dusty hands, or simply put their hands in their mouths. - Young children absorb higher percentages of ingested lead: around 40-50% compared to 10% in adults. - Ongoing development of vital organs in young children, are more vulnerable to damage. MSF has focused its intervention on those most in need, but there are other people affected by this crisis. 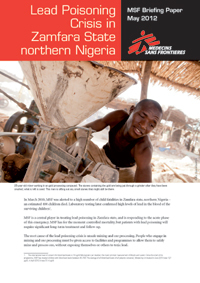 MSF has worked closely with Nigerian authorities to address the issue. MSF believes that still greater coordination is needed by authorities to prevent more people from being poisoned ? through health education and awareness-raising, encouraging safer mining, facilitation of remediation and continued treatment. Neither MSF nor the Nigerian authorities possess sufficient expertise to manage the crisis without assistance and advice. External expertise such as that of Safe Mining Experts is needed. The value of this expertise has been demonstrated through the Remediation carried out by Terragraphics with the Zamfara State Government. Zamfara state contains many areas with significant concentrations of heavy metals in the soil and rocks. There has been gold mining in Zamfara state, northern Nigeria, for decades, but until recently it was not widespread or profitable. Since 2009, the price of gold has appreciated substantially, from around US$800 per ounce, to US$1653 (May 2012). This has resulted in a renewed interest in mining in Zamfara state. An increasingly active artisanal mining industry digs up rocks by hand, breaks them into pebbles with hammers, grinds the pebbles to sand with flour mills, and extracts gold from the sand using sluicing, panning, and mercury amalgamation (and in some cases, cyanidation). Usually the health problems associated with artisanal mining are related to mercury and/or cyanide use. In Zamfara where the gold bearing deposits contain unusually problematic concentrations of lead these are overwhelmed by the enormous effects of lead poisoning. The crushing of pebbles into sand in dry-running flour mills produces enormous amounts of dust which in some places is highly contaminated with lead. Lead can enter the body through the lungs or the digestive tract.